I received a finished copy of the book from Chapters Indigo in exchange for an honest review. If you're interested in picking up this book, my Canadian peeps, this book is currently the May Indigo Teen Staff Pick of the month! It's currently 20% off and also 2x the Plum points for this month! One of Us is Lying centres around the four students who are in detention when another student also in detention also dies. With the way that Simon died, it had to be someone in the room who killed him and all of them hold secrets they would prefer to keep quiet as Simon ran a gossip app spilling the secrets of everyone in the school. Who killed Simon? Each of the main characters that we read the point of view from is one of the four caught in the room and they all fit into some of the archetypes of high school -- Bronwyn, the valedictorian; Addy, the beauty queen; Cooper, the jock; and Nate, the delinquent. As we read the points of view of the four characters, we learn more about them and though we read from their points of view, none of the clues are revealed until McManus wants them to be revealed. Each of the characters has a distinct voice and has their own character arc as they progress with the investigation. It was really interesting reading from each of their perspectives as they encountered more and more problems that came with the intensifying investigation and come to terms with their own secrets. There's definitely a budding relationship in this book and I kind of really ship it even though the dude did some dumb things. The whole mystery of who killed Simon didn't turn out how I expected it to and it really caught me by surprise which I guess is nice, since I read and watch enough crime stories to be able to predict how they turn out. I think I had expected there to be more of the "teaming up to figure out who really did it" going on the book and I was slightly disappointed when it really only started towards the last 1/3 of the book. 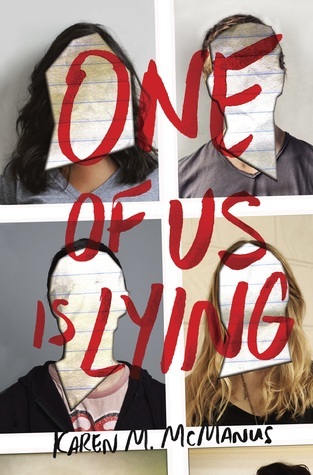 One of Us is Lying is more of a story of self-discovery than the crime thriller I had hoped for. Overall, it does kind of have that "The Breakfast Club" vibe that it was pitched as and an interesting take on a "locked room" crime. It's a great read if you're interested in reads that will somewhat subvert the typical archetypes and also have a serious element of mystery. The one who has the best character arc throughout the novel is definitely Addy. And the mystery definitely had me wondering a lot! It just wasn't the "all about the crime" story that I love and more about self discovery. I love this cover!! I been eyeing this one, I am a little apprehensive lately on books that aren't sci-fi or fantasy since that has seem to be my thing since I have come back to blogging. After your review I am definitely going to give this one a try!